Happy Thanksgiving USSAAC members and guests. Today we are thankful for today’s guest author, Karen Natoci, who shares her ideas about using the Communication Matrix creatively to guide communication partners in promoting progress. The Communication Matrix is a free, online assessment tool to help families and professionals easily understand the communication status, progress, and unique needs of anyone functioning at the early stages of communication or using forms of communication other than speaking or writing”. [Rowland, Charity, 1990, 1996, 2004, 2011; 2018, https://communicationmatrix.org; Design to Learn Projects]. This tool, which was introduced 20 years ago, functions as a way to survey the natural communication abilities of emergent communicators across age groups, measuring some of the earliest reasons for communicating: to reject, obtain, socialize, and to exchange information. The Communication Matrix accounts for all unaided and aided communication forms, is available in a number of languages, and is free for anyone to use at www.communicationmatrix.org. You can learn about the tool, use it and then print the results. I use the Matrix for several reasons: it has a nice visual presentation and makes my evaluation results easy to display in a clear, understandable way. For example, I like to draw on it when conversing with families. I might draw arrows, use different color highlighters and turn the grid into a living, interactive document to map next steps with the team and justify suggested goals. Sharing the completed Matrix at meetings helps to maintain a team’s focus. 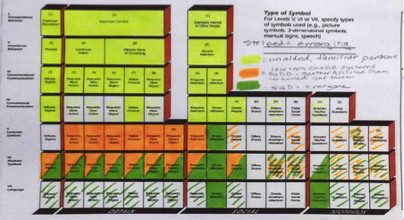 Color coding provides a “map” of progress and allows teams to discuss “next steps”, providing a basis for team decisions while maintaining accountability over time. I explain that at the first two levels of communication (level I, II), the learner may use many ways to communicate and the burden of understanding the message is often placed on a knowledgeable partner (which may involve some guessing.) Communication at the first two levels on the Matrix is mostly successful with familiar communication partners, about familiar topics and routines involving basic needs. Figure 1 shows that the learner may communicate unintentionally or engage directly with an object or person while showing questionable intent to convey a message. In this case, much guessing may take place and communication misunderstandings may occur. Levels I and II are illustrated when ? two sides of this communication triangle are connected (learner conveys interest toward a person OR a topic but not both at the same time) and Level III is satisfied when all three sides are connected (learner conveys topic to a partner OR learner leads partner to the topic). Level III is often a multi-modal, communicative performance between familiar communication partners. Those learners who communicate at a level III are more successful because both the learner and the partner have understood the message; therefore, guessing is reduced or eliminated. Level III communicators often know how to use their body language, calling devices and the environment to meet basic communication needs, gain attention, make choices, refuse and engage in back and forth communicative exchanges. Overall, level III communicators are more likely to be successful in communicating with their less familiar partners. The Communication Matrix is an assessment of a person’s expressive early forms and functions. 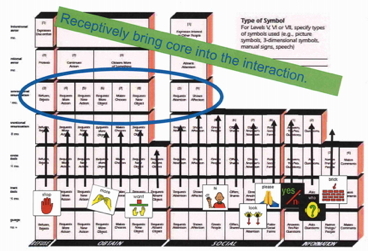 The role of communication partners is to use receptive supports to promote progress on the Matrix by being responsive and helping to “build the triangle” as shown in Figure 1. 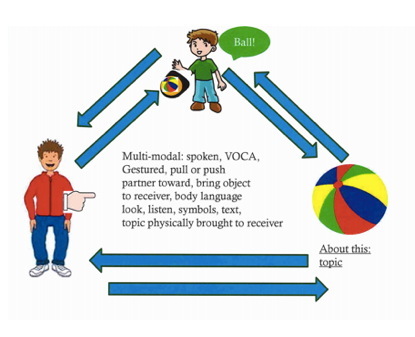 The way partners do this may vary (using objects, gestures/signs, graphic symbols, speech generating devices) but the idea is for the partner to model the use of language forms the learner may be able to use. Modeling on a child’s communication system while simultaneously talking is known as partner-augmented input. We know that many terms have been used (e.g., Aided Language Input, Modeling, Natural aided language, aided language modeling, aided language stimulation, Augmented Input) to describe the evidenced-based approaches to teaching children who are learning to use AAC approaches by modeling the use of AAC tools and strategies in context. 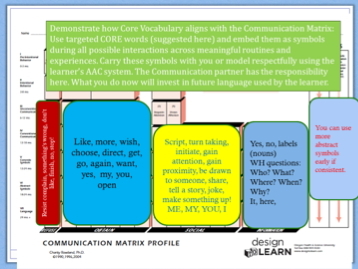 Here’s how I think about it using the Communication Matrix to help guide AAC interventions. Figure 2: Receptive use of core words align with the Matrix. 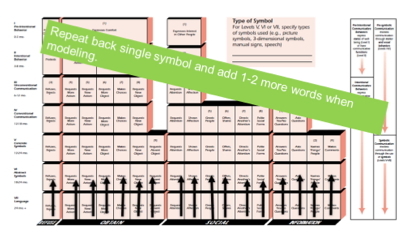 It may be a nice idea to bring the corresponding symbols with you to meetings and demonstrate just how to perform partner augmented input. 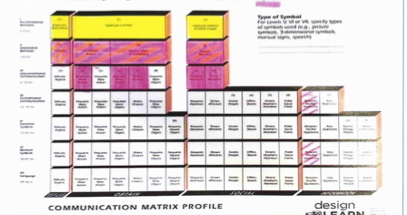 This image is reprinted with permission and is a representation of the printed version of the Communication Matrix (Rowland, 2004). Figure 3: Targeted symbols shown are used for a student who is mainly communicating at a level III. 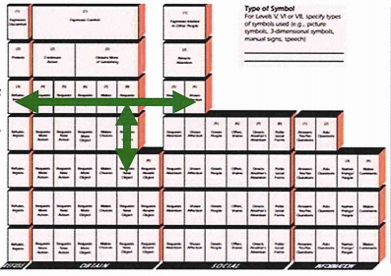 In this instance, the team agreed to emphasize these symbols (level V) receptively, using partner-augmented input. 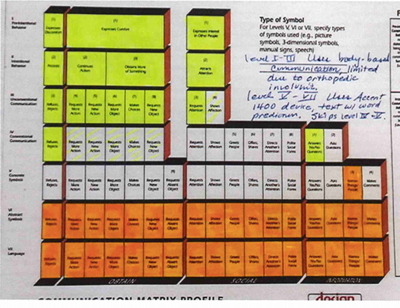 This image is reprinted with permission and is a representation of the printed version of the Communication Matrix (Rowland, 2004). 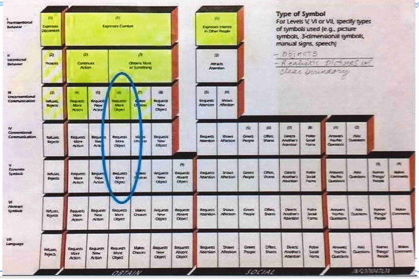 Figure 4: We circled the target area and shared symbols that align with the message to use receptively. The parents of this student were concerned about his need for more social experiences (he had orthopedic challenges and his expressions were difficult to interpret). This student was beginning to use a voice output communication aid to reinstate pleasurable activities (i.e., a big mac to say “more!”) The team used this image to justify the modeling of these core words (pictured here) to build the foundation for his eventual spontaneous use of “hi” or “hey” to greet or gain attention which would be found in his new and more robust AAC System. This image is reprinted with permission and is a representation of the printed version of the Communication Matrix (Rowland, 2004). Figure 5: Sometimes we’ve drawn arrows on the Matrix to consider the learner’s needs and options for intervention and support. In this illustration, we consider supporting more communicative functions (horizontal) or type of symbolic support (vertical). This image is reprinted with permission and is a representation of the printed version of the Communication Matrix (Rowland, 2004). Figure 6: This shows how we may simply draw a circle around the communication function to promote using a new form (their new device). This image is reprinted with permission and is a representation of the printed version of the Communication Matrix (Rowland, 2004). Figure 7: This illustration shows how we use partner-augmented input (PAI) that is just one level above where a learner is communicating. The black arrows depict the receptive communication taking place using modeling (PAI) strategies. This image is reprinted with permission and is a representation of the printed version of the Communication Matrix (Rowland, 2004). Figure 8: The areas highlighted in yellow show how this student’s abilities were limited using body based forms alone with live voice scanning. The areas in orange show how he, undergoing AAC device trials, benefitted from using Unity (Accent 1400 with NuEye). The Accent allowed this student to communicate autonomous messages at a distance. This student’s abilities have moved beyond the scope of the Matrix. We included this image in his AAC Funding report. This image is reprinted with permission and is a representation of the printed version of the Communication Matrix (Rowland, 2004). Figure 9: This Matrix kicked off a wonderful conversation with the team and family as the unaided and aided AAC tools and systems enhanced his communication in different ways with different partners. The “P” indicated in level VII are his pre-programmed messages, used strategically, so that the learner could be a more efficient communicator. This image is reprinted with permission and is a representation of the printed version of the Communication Matrix (Rowland, 2004). 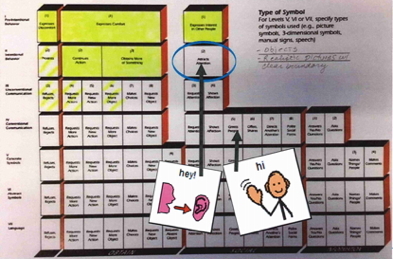 Figure 10: In this Matrix, the yellow shows this learner’s use of body based communication (unaided, including live voice scanning) with familiar partners to include the ability to convey new information through yes/no questioning. The green shows how using the Tobii further enhanced his ability to begin to communicate more completely, at a distance, and with unfamiliar partners. This image is reprinted with permission and is a representation of the printed version of the Communication Matrix (Rowland, 2004). Figure 11: Finally, the most common way to use colors on the Matrix is to celebrate progress! I like to use different colors to show change and usually start here before drawing arrows and circles all over it! 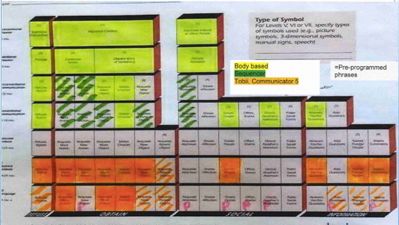 This image is reprinted with permission and a representation of the printed version of the Communication Matrix (Rowland, 2004). Using the Communication Matrix in this way is an alternative, non-standard way of coding the Matrix. It can be a dynamic way to clarify how learners communicate using different tools and strategies, as well as a roadmap for measuring progress. Trained partners play an essential role that involves augmenting partner input at a level above where the learner is successfully communicating on the Matrix. Helping learners to use AAC systems effectively doesn’t come out of thin air and because tools may become available, even accessible to the learner. It happens through thoughtful partners using partner-augmented input and knowing how to model strategies during interactions. This is especially important at the earliest levels on the Matrix because these receptive supports build the foundation for eventual expressive use of a personal AAC system. Add patience and consistency… you have a recipe for success! Karen was an early participant of the Outreach Program as part of the Communication Matrix grant project. She was lecturer at Wayne State University, worked directly with Dr. Charity Rowland as Assistant Professor at OHSU before spending a year learning from the teams at The Bridge School. 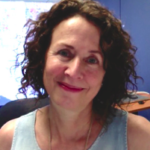 Karen is currently an AAC Clinical Supervisor with The Speech Pathology Group and is the creative author of PrAACtically Reading. She serves on the Editorial Review Committee for SIG 12 (AAC) Perspectives. Author Disclosure: Karen Natoci is not an employee of the Communication Matrix Foundation and does not receive any financial compensation from the organization. The views expressed in this presentation are those of the author and not of the Communication Matrix Foundation.